In it’s simplest form, mead is a fermented alcohol drink made with honey and water. 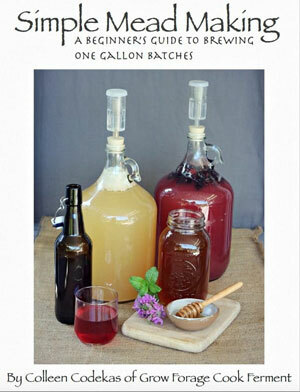 Learn how to make it at home with this mead recipe from Colleen at Grow Forage Cook Ferment. You may have heard some whispers and rumblings about mead lately, as how to make mead has become a bit of a hot topic. But, what is it, anyway? In its simplest form, it’s a fermented alcohol drink made with honey and water, also sometimes called “honey wine” or melomel. Some historians claim that mead is the oldest form of alcohol created by humans, dating back thousands of years. If people back then could figure out how to make this delicious drink, then we certainly can now, and it doesn’t have to be difficult. The best way to start is on a small scale, and a gallon batch of mead is the perfect size for beginners. 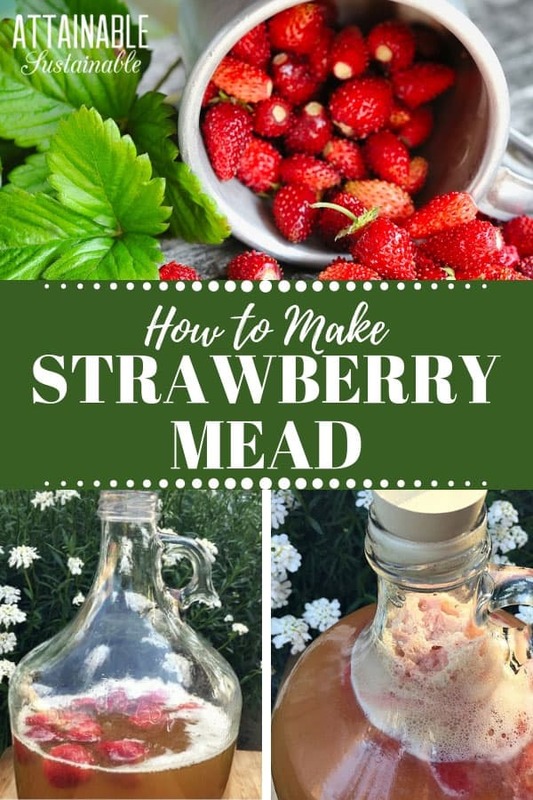 This mead recipe features fresh strawberries, but you can easily substitute your favorite fresh fruit. Say, blackberries. You can also use foraged items like linden flowers or blended wildflowers. With concise and easy to follow instructions, it’s a great way for beginners to learn about the process. Learn how to make mead at home with this simple guide. Cheers! If you start looking up how to make mead, you will notice that a lot of the mead recipes seem complicated, requiring fancy equipment. Maybe after a few tries you will want to expand your skills to that level, but this one gallon mead recipe sticks to the basics. A one-gallon jug with a narrow neck for brewing. I prefer to use glass for this, as I don’t care for plastic, but a plastic jug will work in a pinch. An airlock with a rubber stopper. You can alternatively use a balloon with a pinhole that is attached to the top of the jug. The gasses will be able to escape through the pinhole without letting any oxygen in. (You can also get the glass jug with airlock together for a better price). A thermometer. Just a regular meat thermometer will do. Sanitizer, I like One Step brand as it is easy to use and nontoxic. It is very important that you sanitize everything that will be used prior to brewing. As soon as you add any fruit to mead, it is then called a “melomel,” so that is technically what this recipe is. Feel free to use any fruit you might have on hand, or leave the fruit out completely and just do a straight mead if you’d like. The process is the same either way. When you’ve completed the fermentation process, head over here to learn how to bottle your mead. As soon as you add any fruit to mead, it is then called a "melomel," so that is technically what this recipe is. Feel free to use any fruit you might have on hand, or leave the fruit out completely and just do a straight mead if you'd like. The process is the same either way. First and foremost, sanitize everything that will come in contact with the mead. Put approximately 1/2 gallon of filtered water into a large stainless steel pot and heat until warm, but not boiling. Turn off the heat, add the honey, and stir to dissolve. 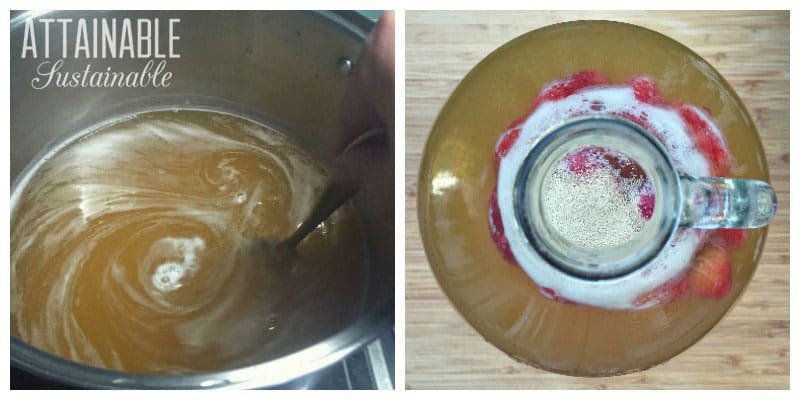 You can put some hot water back into the empty honey container and shake a bit to get all of the honey out. Use a funnel to pour the honey water mixture into the glass jug (it will not fill it completely). Add the strawberries and raisins. Fill the jug with cold filtered water, leaving about 3 inches of space at the top. Cap the jug with its lid and invert once or twice to mix everything together. Check the temperature of the liquid; if it is 90°F or less it's ok to add the yeast. If it's higher, wait a bit until it cools. Add the yeast. One yeast package will ferment up to five gallons of liquid, so you don't need to use it all. I usually use about half of one package when making a gallon. Cap the jug again, and shake it vigorously for a minute or two. This helps to combine and aerate the yeast. Attach the airlock to the rubber stopper, fill it with water to the line, and put it into the top of your jug. The mead should start bubbling within a few hours and the top will get really foamy. Sometimes it foams too much and comes up out of the airlock, but that's ok. Just rinse the airlock and put it back on the jar. It will subside by the next morning. You will see millions of tiny bubbles coming up through the liquid - that's the yeast just doing it's thing. Put the jug in a cool and dark corner and wait. It will take about 6-8 weeks to fully ferment, depending on the outside temperature. It will ferment faster when it's warmer, slower when it's cooler. Check it every few days to make sure it is still bubbling. Once it completely stops bubbling, it is ready to be bottled. The mead is ready to drink right away, but will benefit from some amount of aging, as it can be a bit harsh at first. Go here for instructions on how to bottle your gallon of mead. I’d like to point out that the seeds from the strawberries will cause a bitter flavor. If you can juice fresh strawberries or find juice that does not contain preservatives, then you can avoid the problem. 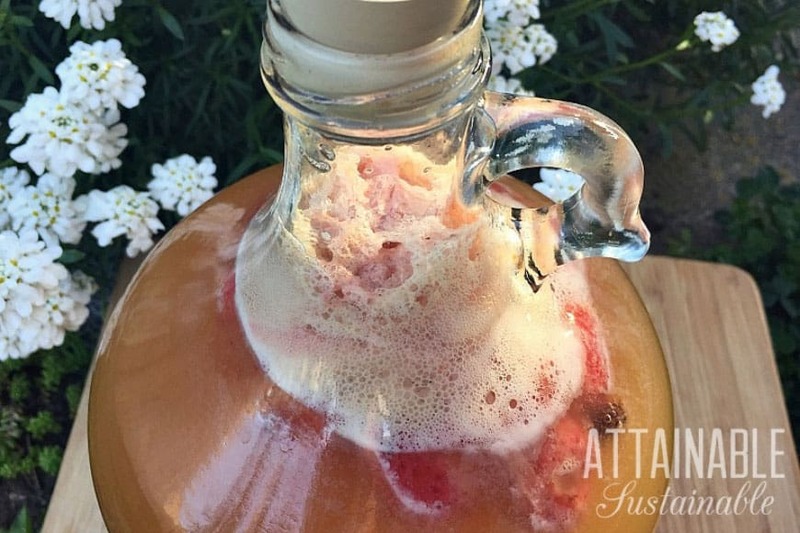 Why would you use champagne yeast instead of mead yeast? I would think if you are making a mead you should use the proper product. I mean you wouldn’t swap your car engine out with a boat motor and expect the same results. champagne yeast is hardier then mead yeast and yields a higher % of alcohol. Brewman, wine yeast is mead yeast as mead is a wine. 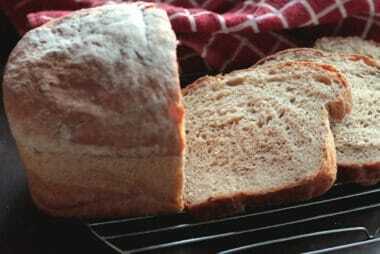 There are many types of yeast that are applicable to mead. Most tend to use yeast that is preferred for white wines. Also, rack off that fruit and the gross lees around 10-14 days. Once under the airlock in the secondary, it can sit for bulk aging. I leave in the secondary a minimum of 3 months. Sometimes I bottle after that, depending on clarity, but often rack again and let sit another 3 months. 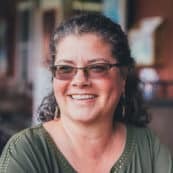 There are great resources for mead making (including recipes) at gotmead.com and stormthecastle.com. At the end of fermentation, do you do any more work on the liquid, like straining it through a charcoal filter? How many bottles will the above recipe yield? No, I don’t filter it through a charcoal filter, I use a siphon to rack it and then bottle it. 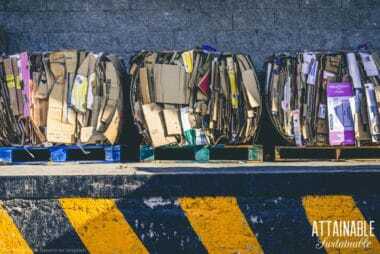 You can read more about that process at the link for bottling at the bottom of the post, and I will be expanding on that more in a few weeks as well. The yield will depend on the size bottles you use 😉 If we’re talking regular sized (750ml) wine bottles it makes about 4-5 (usually right about 4 1/2). 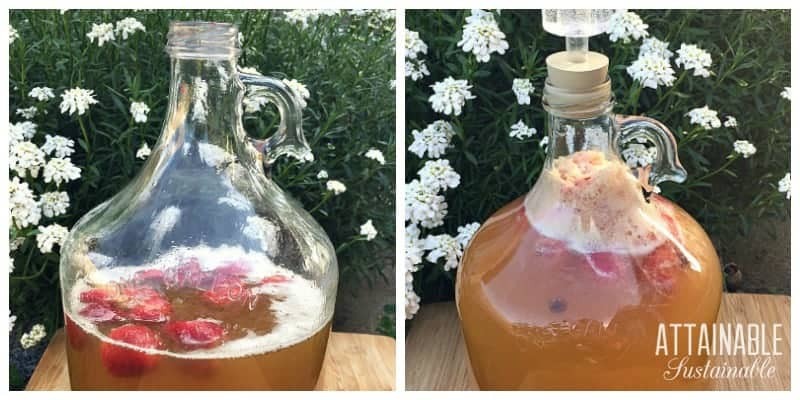 Might sound silly.. but, does strawberry mead really taste like strawberries? Yes it does, I’ve made it and have another batch going right now. It has a nice strawberry taste, but I used one pound of strawberries and I cut them up in several pieces to get the flavor distributed quicker. Please let me know how it turns out after it’s distilled. 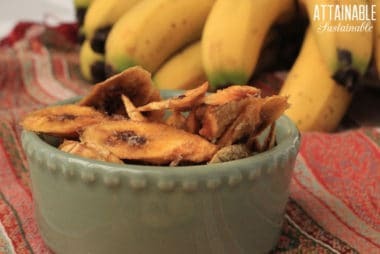 It sounds like it would be kick a-s.
Making this tomorrow. Got all I need including honey from my own hive. So excited. I used this recipe for strawberry mead in the spring of this year and then entered a bottle into my local fair this fall in the amateur wine makers event. I won 2nd prize, which I think is pretty good for a first time maker. And the reason it didn’t win first was because it was not as clear as the winner. So how do I get a clear mead without using filter paper, as both judges stated that they could taste filter paper in other people’s entries? All I did was poured off from the undisturbed centre of the jug with a hose and filter cap. Just made ten litres using the recipe, if it turns out I will be very impressed and happy. Do you rack this recipe into seoncdary? I followed the directions but didn’t add fruit and made a straight mead but know things can be different with champagne yeast. What should the SG be before bottling? You definitely want to rack it. If you let the fruit sit for too long the wine can taste kind of…off. Also, doing your primary fermentation in a bucket makes it much easier to clean the fermented fruit crud out after you’re finished with it. Scrubbing the inside of narrow necked bottles is no fun. You can even bag the fruit in clean permeable cloth or mesh, so you can lift it right out when you’re done with that part. Whatever you do, avoid letting it clog the airlock. It can get kind of explodey, like a shaken bottle of soda. Wondering the purpose of the raisins, can they be left out? I’m allergic to grapes but would like to try this. Colleen says: The raisins add tannins which help to feed the yeast. They’re not totally necessary, just helpful. The raisins act as a yeast activator. you can pick up a yeast activator at a brewing shop or order online as a substitution for raisins that will help the yeast along. What are some of the warning signs your mead isn’t going through the fermentation properly? Is there any telltale signs of color or anything on the top that looks not right? Thanks for your response! I wonder if there would be any benefit to blending the strawberries in a blender and then putting them into the mixture opposed to keeping them whole. I used this as a base recipe to make my first mead and it turned out so delicious! What I did differently was I froze the strawberries and also transferred the mead to a new carboy for secondary fermentation, taking out all of the strawberries and adding a few more new strawberries and honey. Champagne yeast has a habit of all sugars must die. So only use if you want the end product to come out VERY dry. i have a question, can you take out the honey and add 3 lbs of sugar to a pot with spring water and boil it to break down the sugar? Yes you could do that, but it would be more like a country wine rather than mead.